Why does having enough potassium matter? 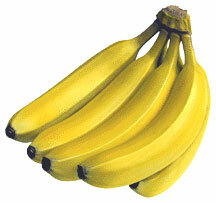 Potassium (also known as K) helps to reduce the risk of stroke and hypertension (high blood pressure). It is necessary for the a body’s growth and maintanance. It helps to keep a normal water balance between the cells and body fluid. It also helps with the contraction of muscles and plays a role in the response of nerves. How much Potassium to have per day: You should get at least 4000 mg of potassium each day. -Brown rice and beans with salsa and chopped avocado on top. -A fruit salad with chopped oranges, bananas, apricots, and cantaloupe. Hey, thanks for stopping by my blog. I am now your newest follower! You have a great blog here, I can't wait to read more! New follower! Would love you to follow back at To Spend Or Save. What a comprehensive and excellent post about potassium! There were some foods that are high in potassium that I already new about (like bananas), but was surprised and happy to see some other favorite foods on the list (Edamame & Apricots). I really love the way your rounded out the post with the menu ideas. The photo and description of the brown rice with the beans and avocado made me hungry. What a healthy and delicious treat! So happy to meet you! I'm following. Thanks for stopping by my nest today. Great blog! Glad to find you from the blog hop! Hi Amanda, I am a new follower, excited to learn from your blog! hi, i am your newest follower. you have nutritious and delicious blog. thanks coming at my blog. cheers! Hi! I'm your newest follower...looks like some great info you are sharing... thank you! Thanks for answering my question--Finally had some time to log in! This is just like having my own personal nutritionist!!! I found a recipe in this month's Cooking Light that has beans, spinach and tomatoes (with chicken). Guess what The Husband is getting for supper! I always eat a banana before and after I play a basketball game to prevent cramps. Potassium foods are known for preventing injuries like cramps and can also take care of our health.